I have always loved decorating. I could spend hours flipping through design magazines and will often envision a room in my head. I joke that my dad just needs to build a shed in our back yard so that I can buy all the things I like and want for my future home. For a while now, I've known that in my next "big girl bed" (once I get my own place), I want a white matelasse bedspread. I love the idea of a white bedspread with pops of color through the use of coverlets and pillows. I'm also a huge fan of Euro shams and the layering of many pillows. 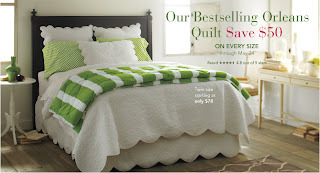 My bedspread for all four years of college was a green matelasse bedspread I actually ordered from Pottery Barn Kids. My favorite detail of the bedspread is probably the scalloped edges. College bedding--if you look closely you'll notice the scalloped edges. Well, knowing that I want white matelasse and like the scalloped edges, I always have my eyes peeled for that perfect bedspread. A few nights ago I was doing some online window shopping and decided to check out Garnet Hill. And what do you think was on the homepage?? THE EXACT BEDSPREAD I HAVE ENVISIONED: white matelasse, Euro shams, and scalloped edges--AND, drumroll please, it's on sale! I've decided to order it now and incorporate my current bedspread (which I still love 7 years after I first got it) kind of like the green spread and pillows are added in the picture. I'll post pictures once it comes in! I would love sheets in this print! They also carry tons of fun sheets! 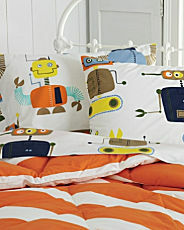 Love these robots for a boy's bedroom! I'll take everything in this picture! These would be perfect for my future rivah house! Oh, and did I mention--they also sell clothing for women and kids? Love the ruffle and ruching detail. 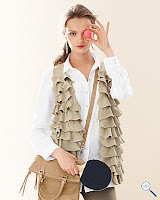 Not sure if I could pull it off, but I love this vest! This would be perfect with my bright yellow chino shorts! 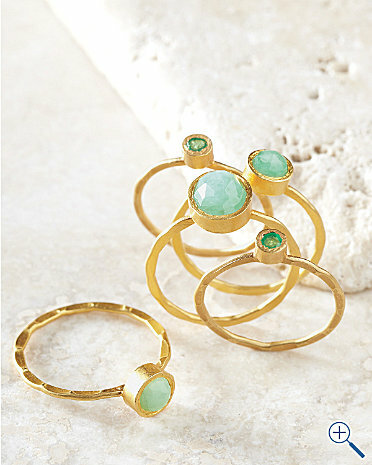 I have been dreaming about these rings for a few days now! Do you like Garnet Hill? Where are some of your favorite places to find bedding? My mother has that white Garnet Hill bedding! It is so so soft. The best part is that you can buy funky sheet sets to mix up the look if it starts to get old...perf! 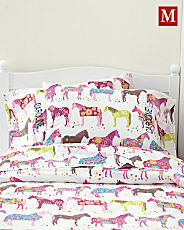 I am loving the Painted Ponies bedding...it is absolutely precious! I need that green runner/rug. LOVE! Oh la la, gorgeous finds! 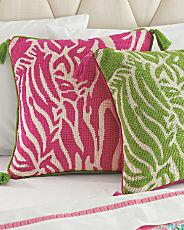 Love the needlepoint pillows and the stacking rings! I love those little stacking rings, and I love your college bedding! Why would you want to stray from it?! I re-did my entire bedroom when I moved back home, and it will serve as a "grown-up" guest room once I move out. I love my matelasse bedding from West Elm! My husband gets too hot at night for a comforter, so it was the perfect solution. 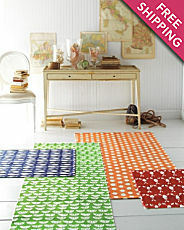 I layer a Dwell Studio quilt from Target on top for more color. Congrats on finding exactly what you want on sale - that always makes my day! I love your current bedding & the new quilt you just purchased. Both are so lovely!! Eeh! My bedding is from Garnet Hill. I think we really are meant to be great friends! I LOVE the white bedding you chose! It's so classic and crisp. The scalloped edges make even more adorable! We have white bedding too, with a crisp green monogram and euro shams! I love the one you bought! 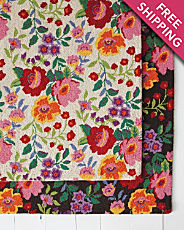 I love that green needlepoint pillow too...that might need to be incorporated into the pillow scheme in our master :) I had never heard of Garnet Hill, but it's going into my favorites folder now! I always want to buy things for my future home as well! And I was thinking about doing white bedding with colorful pillows and things for my bedroom next year! This is a totally amazing new source for me! I can't wait to check out the rest of their stuff....that bedding is going to be FABULOUS! Love GH. I have Lilly bedding that I purchased this winter to bring some Spring into our bedroom. I can tell you that it really saved me on a snow day! Great post today. LOVE the bedding you chose. and lilly will always be my fave - totally reminds me of my college days! What fantastic finds! I LOVE your bedspread. 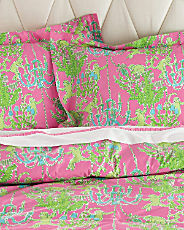 And the Lilly sheets are fabulous! I love Garnet Hill. Their products are so soft and luxurious! I love Garnet Hill and look forward to getting the catalog every month! Love the new bedspread, it will look fantastic! When Lilly and Garnet Hill joined forces, I nearly died. LOVE! I'm trying to play catch up. I love Garnet Hill. It's one of my favorite catalogues. I love Garnet Hill! I'm trying to pick a bed spread from them for my apartment next year. 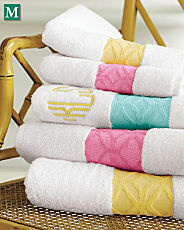 I have the monogrammed Chinoiserie Towels!